In this blog post, I would like to discuss the clinical use of the Five Elements and, in particular, their Cosmological sequence. 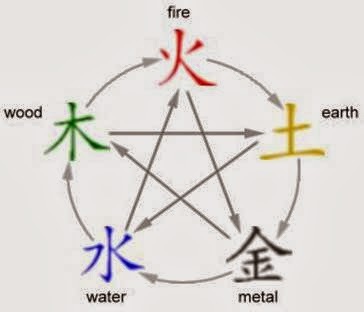 By “cosmological sequence” (my own term, not a Chinese one), I mean the arrangement of the Five Elements in a cross-like fashion rather than the circular arrangement of the Sheng and Ke cycles that are very familiar to every practitoner and student of Chinese medicine. The “Cosmological Sequence” has Water at the bottom, Fire at the top, Wood on the left, Metal on the right and Earth in the centre. These are associated with the compass directions of South for Fire (at the top), North for Water (at the bottom), East for Wood (on the left), West for Metal (on the right) and no direction for Earth in the Centre. Earth has not compass direction as it is the centre, the point of reference. 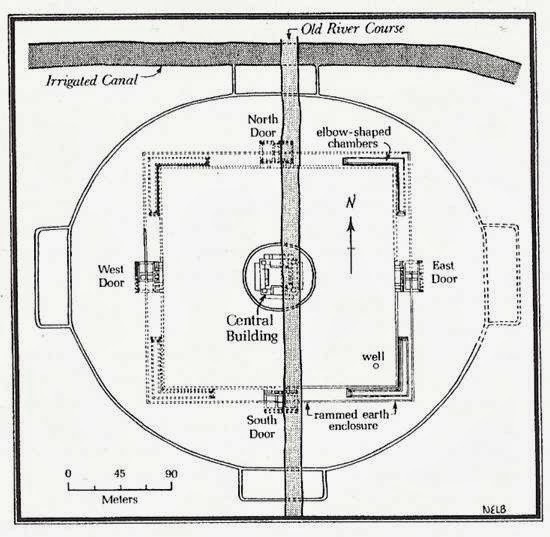 Plan of the ritual complex built by emperor Wang Mang (AD 9) as a reconstruction of the Ming Tang of antiquity During the Shang dynasty, the theory of the 4 Directions (plus a Centre) prevailed: this is obviously very similar to the scheme of the 5 Elements (with correspondence of seasons and directions). This is of course a Confucian, ethical interpretation of the 5 Elements (which I would say is alien to medicine). Notice the reference to the “Dao”: “Dao” was a Confucian as much as Daoist ideal. 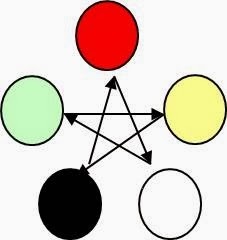 The theory of dynastic transmission based on the 5 Elements was elaborated by Zou Yan: he envisaged the dynasty transmission as linked to the reverse Ke (i.e. 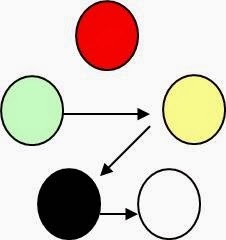 “Insulting”) cycle of the 5 Elements. In other words, a dynasty was followed by one pertaining to the Element controlling the Element of the previous dynasty. For example, the dynasty pertaining to Fire would be succeeded by the one pertaining to Water (which overcomes Fire). To put it differently, a dynasty pertaining to Fire had to be succeeded by one pertaining to an Element that Fire could not conquer (“Insulting cycle”), i.e. Water.The onset of a dynasty would be preceded by omens heralding the ascension of a particular dynasty. The following Table lists the opens that appeared in various dynasties. Calculating the transmission cycle of Wu De 五 德 (5 Powers), the First Emperor (Qin) held that Zhou had the Power of Fire and Qin was replacing the Power of Zhou and should follow the Power that Fire could not conquer. From then on, the Power of Water had begun its dominance. Let the beginning of the year be changed and all tributes to the court start at the 11th month, let robes, garments, feathers, fur, stakes and flags all be in black, let the number 6 be used for regulations…Let the Yellow River be renamed the “De Water” [德 水], symbolizing the beginning of the Power of Water. Let the policy be harsh, firm, perverse, and occult, with all affairs determined by law. Be severe and strict rather than benevolent (ren 仁), kind (en 恩), harmonic (he 和) and righteous (yi 義) [a “dig” at Confucianists]. 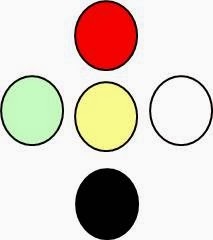 Only then will it be in accordance with the number of the 5 Powers. 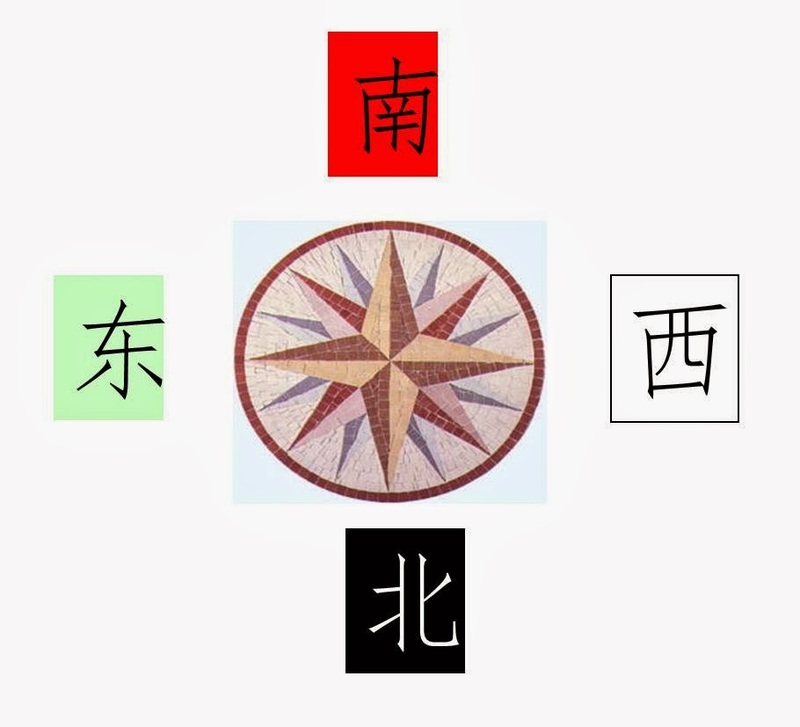 For the first Qin emperor, the theory of the 5 Elements was a cosmology of conquest and violence that replaced the moral intentionality of Heaven. While for Han Confucian scholars, the theory of the 5 Elements was a moral cosmology manifesting the intention of Heaven. Wang A H, Cosmology and Political Culture in Early China, Cambridge University Press, Cambridge, 2000.
chapters of the Su Wen and Ling Shu. The most common correspondences of the 5 Elements are with the following: Colours, odors, directions, organs, seasons, flavours, numbers, orifices. The numerology of 5 is used in many other instances to classify things such as the 5 stagnations, 5 fullnesses or 5 deficiencies. In the Cosmological sequence there is a “vertical” connection between Water and Fire in which they communicate with each other and nourish each other: this is very different than the relationship in the Generating cycle in which Water controls (and therefore diminishes) Fire.The communication between Kidneys and Heart is essential in menstruation. The Kidneys are the origin of Tian Gui that, in women, corresponds to ovaries, ova and follicles. It is the tides of Kidney-Yin and Kidney-Yang that produce the menstrual cycle. However, the Heart plays a role in this as it induces the downward movement that brings on bleeding at the onset of menstruation and the release of eggs at ovulation. Heart-Yang also descends to Kidney-Yin to help to produce Tian Gui.